I often see people not utilizing their Hive setup effectively. Although not every match will be the same (there could be situational circumstances that change the way you will want to setup your Hives), I thought I would provide some general configurations for the inexperienced Ah Muzen Cab player. 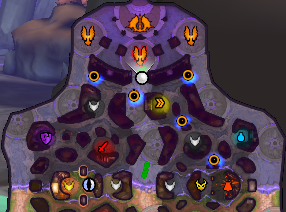 This setup allows you to return to lane quickly, as well as provides access to Back Harpies, Red Camp, Purple Camp, Oracles, Gold Fury, and a majority of duo lane. This setup provides assistance when putting pressure on phoenixes, and also gives you a clean route to Fire Giant. You may notice that there are only 5 Hives in this configuration. The sixth and final hive can be used situationally and offensively when pushing up past the range of your other Hives. This setup renders your entire backline effective with Hives when your objectives are getting harassed and you need to strictly defend. Notice the sixth hive in front of the middle phoenix. However, this Hive can be used situationally, especially if your team successfully defends and is able to turn a fight and chase/push up. This is freaking awesome dude. One minor adjustment that would be more conservative defense would be putting one hive behind your tower rather than near the red. Backup in case the enemy pushes and destroys your purple hive. 132192 Branmuffin17 This is freaking awesome dude. One minor adjustment that would be more conservative defense would be putting one hive behind your tower rather than near the red. Backup in case the enemy pushes and destroys your purple hive. Thank you, and I appreciate the suggestion. Over time I've come to find that each match presents different factors in what the best placement for a hive network would be. Like you said, putting a hive behind your tower would be a more defensive setup with increased reliability. That being said, the example hive network is shown in more of a general laning sense (neither winning or losing). There are many different configurations you can use. I just wanted to provide some standard examples that will at least serve as a starting point when crafting a network. Newer AMC players can feel this out and then make adjustments based on what feels best to them. Generally, I do like the hive near red camp for several reasons. It's important to remember that Hive also acts as miniature wards. This keeps an eye on a high traffic rotation route between mid and duo as enemies will usually detour to check on red camp. With this hive, they will usually be pinged, and if not, you will at least see the hive disappear off the map when they destroy it, indicating enemy movement. This hive can also be repositioned directly on top of red camp as a ward if your red camp is getting stolen on a consistent basis. In some situations, it can even ward Gold Fury if your team is struggling with warding objectives. I feel that hives and hive networks are an improperly utilized part of Ah Muzen Cab's kit that many people overlook. Because he has no mobility in his kit other than movement speed, crafting routes and warding with hive becomes an integral part of his game. 132193 DV-8 Thank you, and I appreciate the suggestion. Over time I've come to find that each match presents different factors in what the best placement for a hive network would be. Like you said, putting a hive behind your tower would be a more defensive setup with increased reliability. That being said, the example hive network is shown in more of a general laning sense (neither winning or losing). There are many different configurations you can use. I just wanted to provide some standard examples that will at least serve as a starting point when crafting a network. Newer AMC players can feel this out and then make adjustments based on what feels best to them. Generally, I do like the hive near red camp for several reasons. It's important to remember that [[Hive]] also acts as miniature wards. This keeps an eye on a high traffic rotation route between mid and duo as enemies will usually detour to check on red camp. With this hive, they will usually be pinged, and if not, you will at least see the hive disappear off the map when they destroy it, indicating enemy movement. 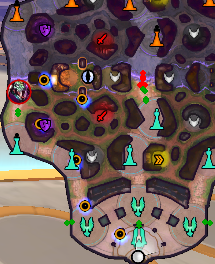 This hive can also be repositioned directly on top of red camp as a ward if your red camp is getting stolen on a consistent basis. In some situations, it can even ward Gold Fury if your team is struggling with warding objectives. I feel that hives and hive networks are an improperly utilized part of [[Ah Muzen Cab]]'s kit that many people overlook. Because he has no mobility in his kit other than movement speed, crafting routes and warding with hive becomes an integral part of his game.